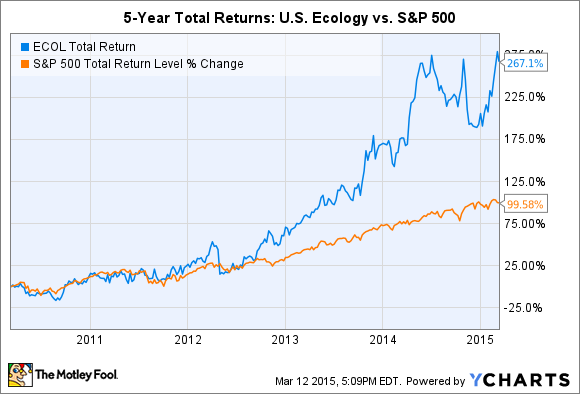 Three real reasons U.S. Ecology stock could fall. Boring stocks often produce above-average returns. You might have to give up flashy press releases and well-known leaders to get them, but "boring" is often accompanied by companies crushing a market niche year after year. Take environmental services company U.S. Ecology (NASDAQ:ECOL) as an example. Treating and properly disposing of hazardous waste may not make your heart beat any faster, but there's no arguing with the steady market-beating returns handed to investors over the years. ECOL Total Return Price data by YCharts. While there are several good reasons U.S. Ecology stock could rise, let's consider the flip side, too. What potential pitfalls should investors know about? Last June, U.S. Ecology completed the $465 million acquisition of The Environmental Quality Group, also referred to as EQ. Investors may wonder why U.S. Ecology would dilute its earnings -- historically entirely dependent on high-margin treatment and disposal operations -- by acquiring EQ, which generated a majority of business from low-margin service contracts, in the first place. Management's long-term vision is for more nimble field services to eventually feed high-margin business to treatment and disposal facilities. The problem: It likely will take years for that thesis to play out. And we all know how impatient Mr. Market can be. There's no denying that operating margin will decline in the near term after injecting lower-margin services business into the company. In fact, that's exactly what happened in 2014, which had two full quarters of operations after the acquisition. Consider that U.S. Ecology registered operating margin of 16.2% in 2014 compared to 26.3% in 2013. Profitability ratios will fall further in 2015, which will be the first full-year with contributions from EQ assets. Management is betting that, in the long run, operating margin will climb higher thanks to U.S. Ecology becoming a more vertically integrated company. Will Wall Street demonstrate patience and give the company the benefit of the doubt, or will analysts be short-sighted and punish less profitable near-term operations? While net income grew nearly 19%, investors only enjoyed a 3% bump in EPS. To be fair, adjusted EPS was much higher, at $2.02, and the company projects diluted EPS this year will register from $1.76 to $1.92. But you'll notice that the low-end of earnings guidance actually represents a slight decline in diluted EPS. And that's in the face of 30% to 38% revenue growth. Acquisitions can be big, scary events because of the uncertainty they bring. Investors with a long-term mind-set may be willing to ride out the near-term readjustment of U.S. Ecology's business, but it is possible the vertical integrations fail to be as advantageous as advertised. As can be the case with many acquisitions, U.S. Ecology assumed a large amount of goodwill and intangibles when it gobbled up EQ. Together, the two categories represent assets that have value (noun), but are difficult to value (verb). Things such as brand names and recognizable logos that, in the environmental services industry, can conjure up good feelings of quality and effectiveness in the minds of customers -- a very important differentiator. However, investors will notice that most of the $465 million pricetag U.S. Ecology paid for EQ was in the form of goodwill and intangibles. That could come back to bite investors in the long run if the goodwill and intangibles from EQ fail to deliver their expected value. Making one-time adjustments to either category would lower U.S. Ecology's total assets and, therefore, drag shareholders' equity along with it. As I wrote previously, there are several good reasons for the company's stock to rise. Today, U.S. Ecology is more balanced between treatment and disposal and services compared to its operations mix from one year ago. The company now has the ability to target industrial customers throughout the United States, from the West Coast to the Rust Belt to the Eastern Seaboard. And if management's long-term vision proves correct, investors will reap significant rewards from owning the environmental services leaders. But it's always a good idea to consider the risks posed to your investments, too. Sometimes, the risks remain out of your control; sometimes, they're justified. And sometimes, the risks aren't even truly warranted -- i.e. impatience from Wall Street. The point is to account for all possible scenarios when making investment decisions. Use these three reasons as a starting point for your analysis.